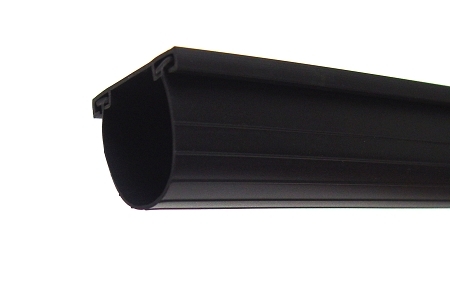 ProSeal™ Garage Door Bottom Seals are made of durable weather resistant PVC. The high quality vinyl remains flexible at extreme low temperatures, providing a tight seal for your garage door. ProSeal™ locks out the elements by conforming to the shape of your garage floor. Helps save energy, by keeping your garage warmer during the winter and cooler during the summer. Also, works great with our Tsunami Seal® Garage Door Threshold Seal. 1. 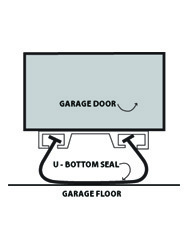 Remove existing garage door bottom seal, if applicable. Attach track to garage door bottom by starting at far left edge of the garage door. Position the track so it is flush with the outside edge of garage door (edge closest to the street when the door is closed). Using a power drill/driver, install one screw ½” from the edge, through the center of the track and into the garage door. Install the next screw approximately 6” from the previous screw. Continue installing the screws with the last screw ½” from the opposite edge, of the first track. 2. Next, line up the second track, flush with the first track, so the channels lined up perfectly. 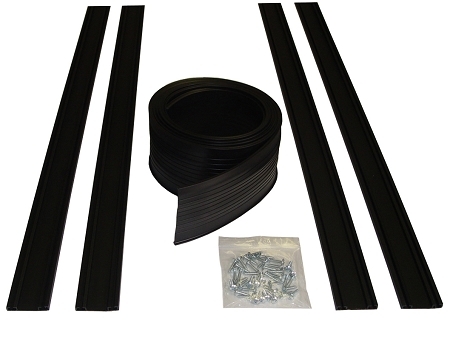 If this is the last track to be installed, before attaching to the garage door, check to see if you will need to shorten the track. If so, use a hack saw to cut the track to the desired length, so it is flush with the right side of the garage door. Install the first screw ½” from the end closet to the first track and continue installing the screws, as described above. Repeat this process until you have installed all of the sections of track. Quick Tip: Mix a bucket of water with some liquid dish soap or liquid laundry detergent. Place the seal in the soapy water and pull it out as you install it into the track. 3. Starting at either end of the garage door, insert both of the ¼” T-ends, attached to seal, into the track. Next, slide the seal into the track, all the way to the opposite side, so that the seal is protruding 2” beyond the end of the track. Now, tuck the excess 2” piece of seal, back into the U-shaped opening. This will lock the seal in place. Finally, trim the opposite side down, leaving 2” protruding and then tuck it back into the U-shaped opening. For wood garage doors, if the track hits the garage floor or driveway when closing, adjust the garage door upward, so the track does not hit. For roll up doors, if the extra thickness of the Garage Door Seal causes the garage door opener to automatically reopen, adjust the opener at the motor.